Get Yourself the Perfect Handbag! What is your favorite style of handbag?? I used to like the nice small purses that don't get in the way, aren't heavy to carry, and can be left behind when you don't want to take a purse. NOW, as a mom, I am always carrying a huge and HEAVY tote type handbag around with me wherever I go! This is mostly because it also doubles as my diaper bag most of the time and also an activity holder for my toddler! I always call it my "Mary Poppins" purse because I can never find anything and it seems like I could just keep on digging in it (and never find bottom!) and pulling out item after item like Mary Poppins did in her bag! I decided I needed a new handbag for the times I go out with my hubby, with friends or by myself and don't want to carry a huge and heavy handbag around with me! I love my new Annabel in Mallard handbag from this great new company called Emilie M.
Emilie M knows how hard it is for women to find the perfect handbag - one that fits their life in every pocket while accentuating their own personality. Launched in collaboration with Mondani Handbags & Accessories, Emilie M features timeless silhouettes, soft and rich animal-friendly materials and multi-organizational function. An easy weekend bag for a trip to the Hamptons. An attainable fashion statement for the mom on a budget. At a retail range of $50-$80, every Emilie M handbag is an investment piece without the investment. Emilie M is dedicated to being the premier online resource for women to accessorize by offering exciting value product, an engaging shopping experience, access to our favorite style guides and unparalleled customer service. Unlike many of its peers, Emilie M’s direct communication with women allows us to incorporate their comments, ideas and even designs into their product offering and shopping experience. Through its beautiful product offering and unique engagement methods, Emilie M aims to build the first online accessories brand that speaks fashion and value directly to women. 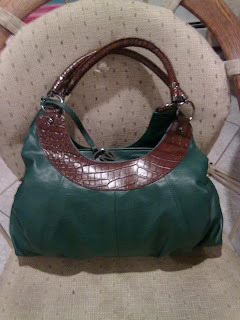 The best feature about my new Emilie M handbag is that it is not bulky to carry but it definitely carries A LOT! It has three storage compartments in the purse and they all hold way more than they initially look like they could! I love how the middle compartment zips shut (and Stays Shut!) so nothing falls out or gets lost! It is also nicely organized and keeps me organized with a zippered compartment inside and two pockets! The two side compartments have a magnetic clasp that keeps them shut and they also have A LOT of room for storage! Check out the purse all closed up...it looks small and easy to carry! But behind its small size, is a lot of storage and room for whatever you like to carry!!! Since I am a mother, I definitely LOVE the storage but I also like it to be easy to carry (since I am usually carrying one or two children at the same time!). This handbag definitely gives me that! The material is light and it fits perfectly under my arm! The only downfall is that the straps do tend to slip a little bit down my shoulder since there are two straps to stay up and they are made of a slippery material. At Emilie M, they believe that every woman should be able to accessorize luxuriously on any budget. I am sure all of you want that too so make sure to check out Emilie M's great selection of stylish BUT affordable handbags! You are sure to find one that fits your personality, lifestyle, and fashion sense! Make sure to stay up to date with Emilie M and see when their new website launches by signing up for their newsletter, follow and pin Emilie M on Pinterest, and follow Emilie M on Facebook. Win It: Emilie M is generously offering (1) $100 Gift Card to a lucky winner!